After two character building games, the Health travelled to Coventry Willow, pumped up to deliver back to back victories for captain Rob Hewlett. A welcome return to the side for two exceptionally talented cricketers, Sam Stephens and David Preece gave the Health much needed strength in depth, for what has always been a tough away fixture. Meanwhile David Preece & Fitzy set about steadying the ship. Fluent stroke play and exceptional running between the wickets, kept the score ticking along nicely. David meant business today, looking back to his brilliant best, whilst Fitzy delivered his first 50 for the club, in the partnership of the season so far. Both men relishing their duty in steering our ship to calmer waters. After Preece and Fitzpatrick were out, with the score well past the hundred mark, we all felt a total of 200 was within reach. Cue carnage. 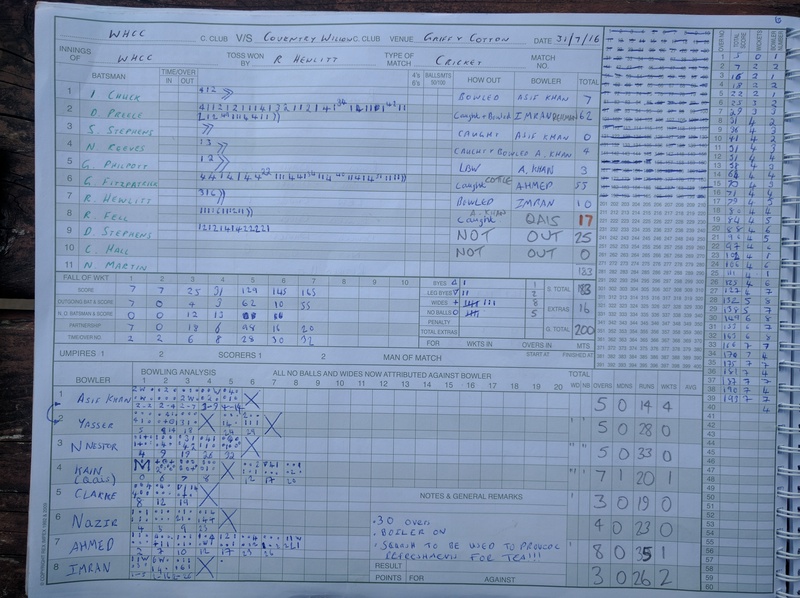 Skipper Hewlitt decided to smash the greenhouse of No27 with a big six. Then enter Rich Fell, to hit a six so big, nobody knew where the ball had gone. It was later reported by Ian Chuck, he had found the missing cherry on his way home…. on the car park of Corley Services. Dave Stephens weighed in with a blistering 24 n.o to take us past the 200 target we wanted. 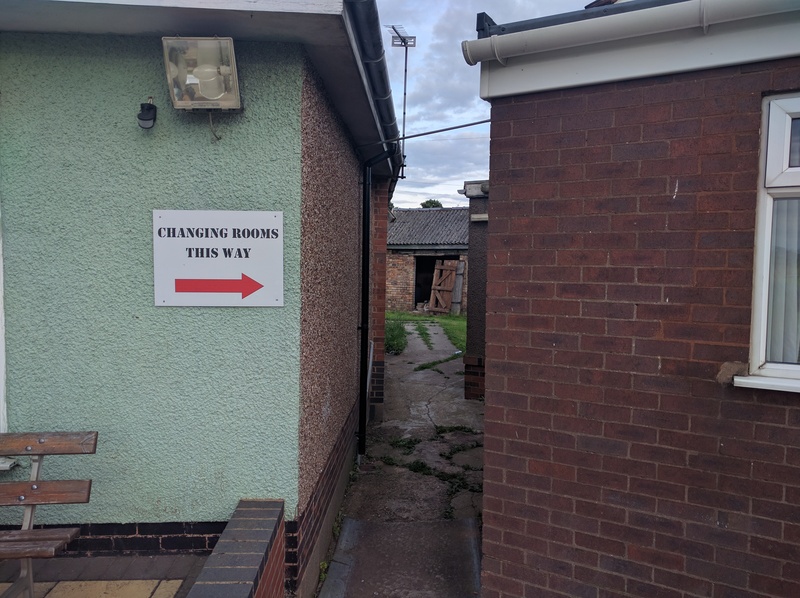 Elf Skipper was a tad concerned with the location on the changing rooms. After a highly nourishing tea of a packet of crisps and a Jaffa Cake, the Health set out to demolish the Willow top order. Sam Stephens opened up, using the John Nicholls feather to mark his run up, paying homage to a club legend. Sam was in no mood to dish out donations. 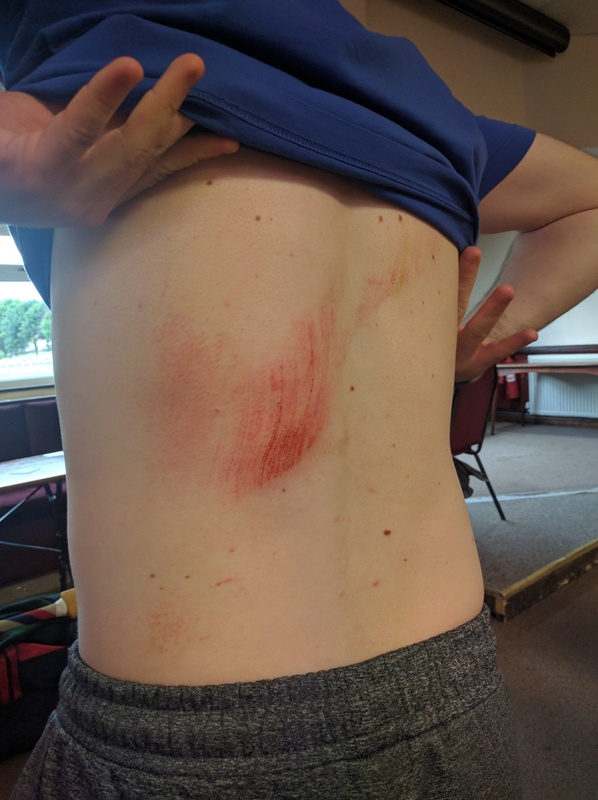 Steaming in for 6 overs, conceding just 6 runs, scaring the life out of the Willow opener with a throat ball, who perished to a Hewlitt diving catch. Vintage Sam. At the other end, Father Dave, rock solid as ever picked up 3 wkts, two of which, caught behind by Fitzy, who gave an exhibition of quality glovework, to complete an excellent individual game. Chris Hall then replaced Sam, with one intention in mind, turn the screw. After a week of soul searching & retirement rumours, Hall responded with a spell of 8 overs 2mdns 3-15. Normal service is resumed. Clearly, when 3 bowlers, bowl 22 overs, concede 52 runs, & take 7 wkts, its game over. With Captain Hewlitt, purring at mid-off, Rich Fell assumed the finisher role, wrapping up the game with 2 wkts, to back up an excellent contribution with the bat. Nathan Martin, again trying hard from the other end, looked up to the skies for divine intervention. He was last seen asking Matt Cottle for the Samaritans phone number. With Willow all out for 128, our fielding gets the final mention. A cool run out from Chuck, a catch from Philpott, and 3 catches each for Hewlitt and Fitzy were all very good. But the highlight, Nathan Reeves, sprinting around the long on boundary at 100mph, crashing into the fence trying to save a four. A fearless effort from a whole hearted cricketer who always sets the right example in the field. An outstanding performance from everyone. 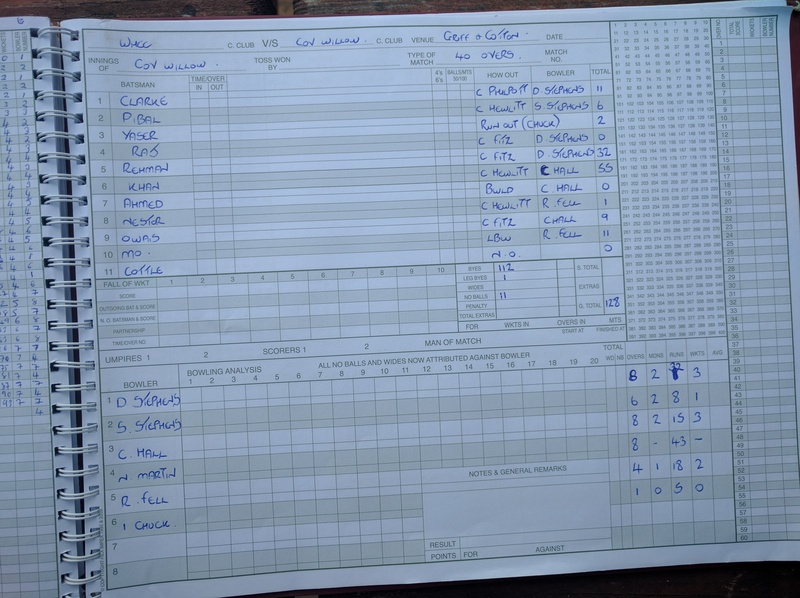 Hi guys I forgot to copy up your innings, can you please scan/text me a photo of the scorebook page? Scorebook has now been added.